Description: The Tac train barrels through the yard, while the 7768 performs some switching duties before departing. Title: 090614006 Westbound DEEX coal empties on main meet eastbound BNSF manifest in siding on Wayzata Sub. Title: 090614007 Eastbound BNSF manifest in siding on Wayzata Sub. Description: Leading a manifest north. 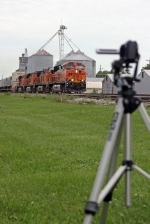 Description: A BNSF S train squeezes through the tight buildings in Emporia, KS. Description: My second photo on Railpictures. Description: BNSF 4196 is leading train M-KCKALT2-09. Description: Here comes the BNSF KCKWILMER Train going the Ashland WYE up to Sioux City. 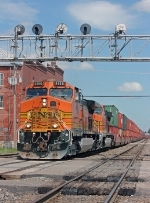 Title: BNSF 4196 leads 264 RoadRailer. Description: BNSF 4196 leads 264 RoadRailer westbound, at Spring Rd. in Seven Mile. Description: Four DPUs help shove an enormous manifest westward up Goffs Hill at mp 597.8, 12:50pm.